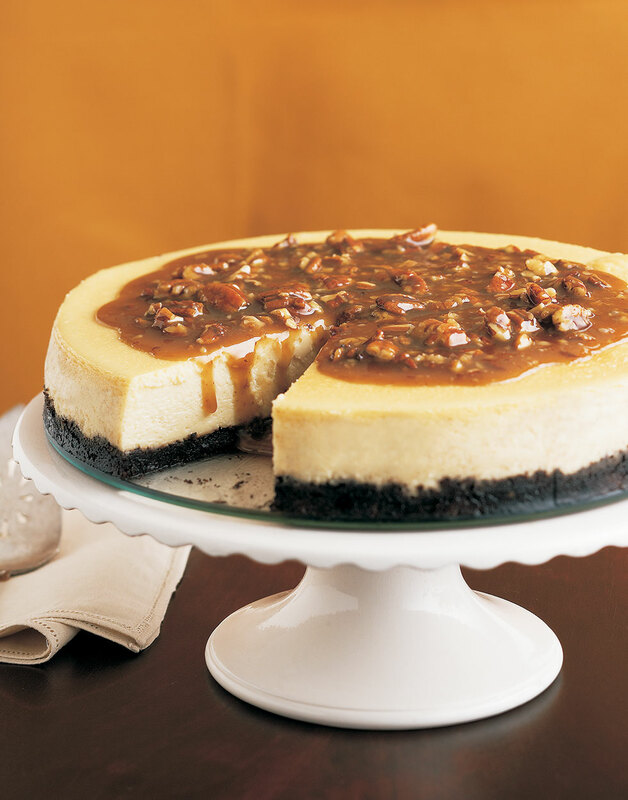 Pecan pie and cheesecake are both hot commodities on holiday tables. This year, try starting a new seasonal tradition by combining these two favorites in a single pull-out-all-the-stops holiday dessert — Pecan Pie Cheesecake. The better the quality of the bourbon you use, the better the flavor in the cheesecake and sauce. For a simpler dessert, skip the cheesecake and serve the scrumptious sauce over pound cake or ice cream. Preheat oven to 375°. Coat a 9-inch springform pan with nonstick spray and wrap entire outside of pan in foil. For the crust, process chocolate wafers and the ½ cup pecans in a food processor until fine. With processor running, drizzle in melted butter. Press mixture into the bottom of the pan; bake 10 minutes. Cool crust completely before filling. Reduce oven to 325°. For the cheesecake, beat cream cheese, butter, brown sugar, granulated sugar, and salt in a bowl until fluffy, periodically scraping sides of the bowl. Add eggs one at a time, fully beating to incorporate into batter after each addition. Add cream, bourbon, and vanilla; beat until ingredients are completely incorporated. Pour filling over crust, smoothing the top. Transfer cheesecake to a roasting pan; place in the oven. Pour boiling water into the roasting pan a third of the way up the sides of the pan. Bake cheesecake until it reaches 155° and sides are set but center still jiggles, about 1 hour. Turn off the oven; leave cheesecake inside for 1 hour with oven door closed. Remove cheesecake from oven; cool to room temperature. Cover cheesecake with plastic wrap; chill 3–24 hours. Remove cheesecake from the refrigerator 30 minutes before serving. For the sauce, combine brown sugar, cream, butter, bourbon, and salt in a saucepan; bring to a boil over medium-low heat. (Don’t stir, but keep a close eye on it so it doesn’t boil over.) Simmer sauce 10 minutes. Tamping the crust with a heavy, flat-bottomed object like a glass or measuring cup ensures a firm crust. For an ultra-smooth cheesecake, fully incorporate each egg into the batter before adding the next.